I recently read a survey which found that 98% of ardent chicken-lovers regard the wings as some of the best parts of the bird. I count myself to be amongst this 98%. From sauce-slathered bar bites, to charred outside nibbles at barbecues and hawker centre har cheong gai, chicken wings have a special place in Singapore's food culture. That said, chicken wings are not exactly the healthiest food around. To keep everyone’s weight in-check, I decided to be the sacrificial lamb and spent three full consecutive days eating chicken wings from across the island. The results? 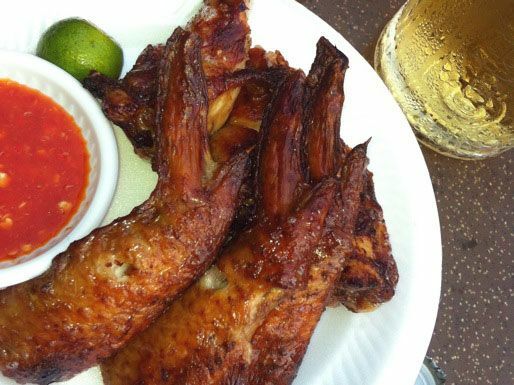 An outbreak of pimples, an expanded waistline and this list of the 20 best chicken wings in Singapore worth spending your calories on. Drizzled with sweet honey and sprinkled with paprika flakes, the chicken wings from Lola’s Cafe are a nice change from the usual wings that are merely served with chilli sauce or ketchup. The wings and drumlets play host to a slew of spices without overpowering the natural flavour of the chicken, and I found myself scraping off the honey on the plate with a piece of the drumlet. I was slightly puzzled that most patrons there are sharing the wings, because frankly I would have had the whole plate to myself. Address: 5 Simon Rd, Singapore 545893. Little Part One Cafe is a small cozy cafe that epitomises tranquillity. At first glance, the buffalo wings looked rather unappetizing as the skin was an unappealing shade of dark brown. But they made up for it in the taste department. Borrowing the sweetness from the Thai chilli sauce that was served alongside, these wings were flavourful with the right amount of spice. Mark my words: I’ll be back to try the Smelly Cheese Buffalo Wings and Mint Miley Buffalo Wings. Address: 15 Jasmine Road Singapore 576584. It is no secret that some of the best eateries in Singapore are congregated in the East Coast area of Singapore. Wings World, a casual restaurant that opened last year adds to that list. Here, it's all about choice. Exercise yours wisely. You can order your wings with a wide array of homemade sauces. On top of classic buffalo wings that comes in four levels of spiciness, Wings World offers other more interesting sauces and seasonings such as Vurry Curry, Mango Habanero and Jamaican Jerk. Of all the flavours, Mango Habanero was the standout, with a fruity sweetness that lingered without being overpowering because of the chilli pepper spiciness that cuts across. Though I wished for bigger and fatter wings, I’d definitely be back to have more of these wings along with some cheap beer. All wings are also served with celery, carrot and their much-raved homemade blue cheese dip. Address: 214 East Coast Road, Singapore 428913. This stall has gained much traction on social media after someone uploaded a photo of Prime Minister Lee Hsien Loong queueing for it. I could finally see why PM Lee spent a good 30 minutes queueing for these chicken wings. The chicken wings, with their crunchy skins laced with a mild prawn paste flavour, and runny-moist flesh on the inside had me sucking the bones dry, down to their very tips. Paired with the spicy-sweet chili sauce, the combination is perfect. The customer right before me ordered 50 chicken wings, and I saw how the owner took great pains to neatly arrange the wings into the packet, demonstrating the sheer amount of pride he has in his work. There is a perpetual queue at this stall no matter what time of the day you choose to visit and it’s not hard to see why. The prices are also almost unheard of in Singapore: $1.20 for each chicken wing and $0.60 for bee hoon. Address: Redhill Lane Blk 85, Redhill Food Centre #01-09, Singapore 150085. He did not ask me how my day was, or where I wanted to go. “What’s that smell? You are making me hungry!” was the first thing the taxi driver told me when I entered the cab with five Eng Kee chicken wings placed in a brown paper bag. I felt slightly guilty for filling his cab with the aroma of the Eng Kee chicken wings because I couldn’t help but take some away from trying some freshly fried ones at the stall. In terms of taste, price and quality of the chicken wings, the ones from Eng Kee are largely similar to the ones from Yan Fried Bee Hoon, but the waiting time at Eng Kee is way shorter. While the chicken wing may look unassuming at first glance, I was sold at the very first bite. This was definitely the best $1.20 I had spent in a long while. Address: 117 Commonwealth Drive #01-711, Singapore 140117. I have a friend who has been going on and on about how Cuscaden Patio has the best fried chicken wings in Singapore so I was eager to finally try them. Located at the basement of Ming Arcade, the smell of deep fried chicken was already wafting through the air when I arrived, and every group had at least a plate of chicken wings on their table. At first glance, the chicken wings looked a tad over-fried and not golden brown like how I expected them to be. As I dipped the wing into the homemade chilli sauce and bit into the succulent flesh of the chicken wing, I was a convert. At just $10+ for half a dozen of chicken wings, these chicken wings are definitely a steal for a pub in town. With a chicken wing in a hand and a bottle of beer in another, my night was complete. Address: 21 Cuscaden Road, #B1-11 Ming Arcade, Singapore 249720. Legend has it that Jeremy, the stall owner of Two Wings, spent six months learning the secret family recipe from the same granduncle who taught the owners of Carona Chicken and Victor Fried Chicken Rice. The first thing that impressed me was the lack of grease on the outer layer of the skin. It immediately made these wings feel less sinful, and one does not having to worry about clogging a vessel while enjoying the meal. The chicken wings are cooked to a rich golden brown crisp, with the meat within retaining just the right amount of moist and juice. Dipped into a homemade garlic chilli sauce that gave the wings a nice bit of zest, I would gladly trade my IKEA chicken wing fanaticism for these.Appropriately named Two Wings, I could see why no one could stop at just one wing. Address: Blk 119 Bukit Merah Lane 1, #01-40, Singapore 151119. Located at the extreme end of Singapore, The Bark Cafe provides an entirely alfresco dining experience (read: no air-conditioning, but shelter and fans provided). This café-restaurant beside the Changi Chapel and Museum has a calm, relaxed ambiance and is a good switch from the usual hustle and bustle of the city. The chicken wings here have received the stamp of approval from celebrity chef, Eric Neo, who claimed that these are one of the best wings he had. Perhaps it’s because I had such high expectations of the wings here, I thought the wings here were merely slightly above average. What came as a slight disappointment to me was that the quality of these wings were fairly inconsistent. One of the three wings I consumed was slightly undercooked and not piping hot like the other two that were served. Nevertheless, this is a great place to be for a quaint, quiet afternoon. Address: 1000 Upper Changi Rd N, 507707. Housed in a 1910 Peranakan shophouse, this cozy 2-storey bar with antique carvings and unpolished wooden flooring is an extremely popular after-work hang-out location among both expats and locals. No. 5 Emerald Hill serves wings that will make the KFC Colonel cry with envy. The chicken wings are marinated in shrimp sauce and Chinese wine, and are the perfect finger food to wash down with a pint of beer and one of their classic martinis. It takes self-discipline not to polish off the whole basket of wings within minutes. With a crispy chicken wing in a hand and a beer in another, there are few places I’d rather be on a Friday night. Address: 5 Emerald Hill Road, Singapore 229289. This is an extremely popular fish bee hoon stall among Singaporeans, and the fish soup here is one of my personal favourites, but that is an article for another day. The lesser-known fact about this place is that they serve up really good prawn paste chicken (or otherwise known as ‘har cheong gai’) as well. It's always freshly fried, and with the right amount of crisp on the outside, while being juicy and fragrant on the inside. The use of premium prawn paste with fresh, rather than frozen, chicken wings makes a huge difference to the taste. I have no complaints about this place except for the slightly erratic Uncle who tends to be a little angsty sometimes. Still, I’m willing to put up with his cranky attitude because of the amazing quality of his food. Address: 19A Dover Crescent #01-05, Singapore 131019. Betcha didn’t know huh? Yes, your trusty Beer Market packs so much more than just a good live band and beer. While they have lots of excellent bar grub to choose from, do yourself a favor and don't skip the honey glazed BBQ chicken wings. The sweetness of the honey nicely compliments the natural flavour of the poultry, making these wings surprisingly addictive. Once, I had 14 honey glazed BBQ chicken wings in a single night and woke up with a voice so coarse that my parents could not recognize it. I had no regrets. Address: 3B River Valley Road, #01-17/02-02 Clarke Quay, Singapore 179021. This list wouldn't be complete without a Korean Fried Chicken brand and Kko Kko Na Ra is a significant step above the "fast food" Korean fried chicken chains of 4 Fingers and Bon Chon. One of the very first restaurants in Singapore to serve Korean Fried Chicken, they have been maintaining their high quality ever since they opened in 2008. By double frying and removing the fat from the skin, the Koreans have developed a crunchy, non-greasy deep fried chicken, mostly dipped in sauces. The chicken here is considerably a lot thicker and fleshier, but pricer as well. Opt for the Chicken Combo Set I say, that comes with three flavours: sweet and spicy, soy garlic, and original. The best part of Kko Kko Na Ra is that it opens past midnight. I can’t say no to having fried chicken for supper. Address: 57 Tras Street, Singapore 078996. One of my personal life goals is uncovering cheap and good food in Singapore, and I consider Tony Cafe one of my achievements. The Adelphi is a sleepy mall that sees more shopkeepers than customers, except during lunch hour when hordes of office workers head over to Tony Cafe. Tony Cafe is an economical rice stall that sells affordable home-cooked food. But its best-kept secret is the Fried Chicken Rice Set that is only served on Monday, Wednesday and Saturday. While the batter is slightly bland, the marination sits thoroughly on the meat and is flavourful even to its bones. Address: 1 Coleman Street, The Adelphi, #02-23, Singapore 179803. I actually have a WhatsApp group chat that’s titled “Punggol Nasi Lemak” with some food emoji because this is a frequent supper spot for my friends and I. While I have heard mix reviews about the Nasi Lemak here, the fried chicken wings here are indisputably delicious. The wings are nicely battered and marinated so well that one is immediately rewarded with a crunchy, juicy bite filled with that elusive flavour from the perfectly fried chicken wings and drumstick. There is no greater gratification than completely stripping the flesh and skin off the bones of the chicken wing and drumstick here. Address: 238 Tanjong Katong Road, Singapore 437026. I had my first taste of Wingstop last year. A lady working out at Wingstop was providing samples to visitors at Bedok Mall and I thought to myself “another fast food chain selling fried chicken in Singapore?” Despite my initial skepticism, I ended up eating my words because after consuming a full meal of chicken wings and fries, I was relatively impressed. I’m an avid cheese lover and Garlic Parmesan is without a doubt, my favourite out of all the flavours I tried. Parmesan cheese is generously sprinkled on every chicken wing, and each cheesy bite has a hint of garlic to go with it. Other flavour I enjoyed are Louisiana Rub, Lemon Pepper and Teriyaki. Wingstop also offers boneless wings for those who may prefer fuss-free consumption though to me, part of the joy of eating chicken wings comes from biting every little tiny bit of succulent flesh from its bones. Address: Bedok Mall #B1-53, Singapore 467360. Originally featured in our places to go on a road trip in Singapore, I like Chuckwagon for its secluded location, western cowboy decoration and friendly service staff. But it was its unforgiving, fiery buffalo wings that really got my attention — crisp on the outside and juicy on the inside, covered in a sticky red glaze that I found hard to resist. The buffalo wings here come in ten levels of spiciness. Level Two was just right for me and I couldn't consume Level Three without gulping down some water. Address: 7 Portsdown Road, Singapore 139298. One of the things that used to frustrate me when I visit East Coast Lagoon Food Centre was the fact that I never really knew which stall is the best, and I usually end up ordering randomly from whoever does the best touting that night. After several visits and recommendations from my friends, I have safely concluded that Teddy Bear BBQ Chicken Wing does the best job when it comes to chicken wings at this competitive cluster. The skin is perfectly crisp and the tender meat is dripping with juice. Fusing the flavours of the sea with that of poultry in the best way possible, Teddy Bear’s expert hands are more than worthy of a spot on this list. Address: #01-44, East Coast Lagoon Food Village, 1220 East Coast Parkway, Singapore 468960. I don’t think I ever visited Bedok 85 without ordering the BBQ grilled chicken wings over there. The BBQ Grilled Chicken Wings here are superbly executed. Crispy and charred bits of glistening skin on the outside while incredibly juicy and tender on the inside. They are well-marinated, and very flavourful both on the outside and inside. The bright heat of the tangy chili sauce and a squirt of lime highlights the flavor and made these wings even more addictive. This is the perfect side dish to go along with your favourite bak chor mee. A word of caution: expect to wait at least 20 minutes for these wings during peak hours. Address: 85 Fengshan Centre, Blk 85 Bedok North Street 4 #01-53 Singapore 460085. Don’t be distracted by the skimpily dressed waitresses at Hooters, their world famous chicken wings are the real catch over here. The skin was crackly and crunchy, good enough that I found myself scrabbling after the bits and pieces of shrapnel that fell away. The wings were well-seasoned and have a genuinely spicy kick, lifting the flavours for a common finger snack. With five secret sauces to choose from, Hooters is definitely worth a revisit. Address: Blk 3D, River Valley Road, Clarke Quay #01-03 Shophouse Row, Singapore 179023. Watch out, Hooters – you’ve got competition. Wings Bar, a 1940s World War II aviation themed watering hole complete with hunks and babes in flight suits and short skirts, serves up buffalo wings done in many ways. The wings on their signage do not refer to the chicken wings but the overall aviation theme. Nevertheless, they serve up pretty interesting chicken wings. Choose from ten different Buffalo wing flavours, including the original B52s, the Thai afterburner and Japanese zero teriyaki selection. For something completely different try the house nachos served with layered cheese and sour cream, and topped with spicy beef for an extra kick. Address: 3D River Valley Rd, Singapore 179023. A good wing needs only three things – to have come from a quality bird, to have the right texture and to be smothered in a sauce that is delicious but not so in-your-face that you can’t taste the chicken. Sounds simple, right? But the simple things are often the hardest to get right. Still, these 20 eateries have nailed it. My personal favourites are Eng Kee, Yan Fried Bee Hoon, Beer Market, Lola's Cafe and Wingstop. As a kid, I have bugged my parents on multiple occasions to buy me my favourite chicken wings. Chicken wings have accompanied me through multiple ups and downs in my life - the memorable house parties, the family gatherings and the time I failed my exams. Chicken wings are truly the Grande Dame of comfort food, and will continue to be for a long time. We would like to thank our sponsor Pickat for making this post possible. If you enjoyed our list of where to find the best chicken wings, you'll love Pickat too. It is a food app that makes it easy for foodies to read the latest top reviews and most importantly - find great coupons for freebies!